Sorry I missed emailing last week! We had a sweet service project for this couple in the ward and guess how old they are turning.. 90!! Loco! I’m sure all you guys were just devastated hahaha. Nah, but all is still well here in the land of the green. A lot has happened the past two weeks, so I'll try to pack it all in. So we'll start with a highlight (not so highlight) from last week. I'll start off by saying I am OK! No injuries. But, last week we got in a car accident, and sadly we hit directly on the left fender so it bent the wheel axle and made the car not so drivable. We didn't want to have to get it towed, so the police officer told us to just drive slow back to our apartment. We didn't realize how bad it was until we started driving and it was pretty sketch! We almost got into another accident not even lying haha. But, with all the screeching of the bent wheel, we made it home safely. So, the car has been in the shop for the past 2 weeks and we've been surviving on bikes and member rides, it's made it challenging but we've got a lot of good work done. Biking has been great, but my legs are super out of shape. And it doesn't help that Mankato is the hilliest city in the world!! Definitely gonna get some solid thighs out of it, though. One night last week we were at the tail end of a long bike ride to our next appointment and there was this giant hill, and we sure weren't going to trudge up this thing on bikes so we start walking our bikes up. All of a sudden around the corner this guy comes zooming by on a longboard. We barely saw him in time and had to jump out of the way!! Then we hear him yell from behind us, "where's my momma!?" Hahaha! We busted up laughing 😂. Probably the most random thing I've been yelled at by a passerby lol. Oh, and we got a sweet picture with Godzilla this week! It's this huge statue in the middle of Mankato that we used as a landmark to get picked up from the other elders. Another highlight from this week is that we had a baptism in the ward! The other Elders’ investigator, Cierra, was baptized by her boyfriend Max. They've been our best friends the past two transfers. I conducted her baptismal interview and it was amazing to hear her testimony of Christ and the change that she has experienced through His gospel, despite some doubts and persecution. She was really prepared! The baptism was last Saturday and the spirit there was incredible! And bonus, we even got 2 of our investigators to come and watch. Super cool experience 😊. Quick update on investigators. Pam is still doing well and reading the Book of Mormon a TON! It's awesome! And she came to the baptism and loved it which we are super excited about. We've also been teaching Cathrine, the lady we met last transfer with the soccer-playing border collie. She got the news that her daughter has stage four cancer and doesn't have much time left. We had a comforting plan of salvation lesson with her and it was great. She also has attended church with us the last two weeks! I'm so grateful for the answers that the restored gospel gives us that many people don't have. Having an eternal perspective of God's plan of salvation gives us so much hope and direction in our lives! I know without a doubt that our eternal journey didn't start at birth nor ends at death - we are eternal beings! También, this week is transfers. 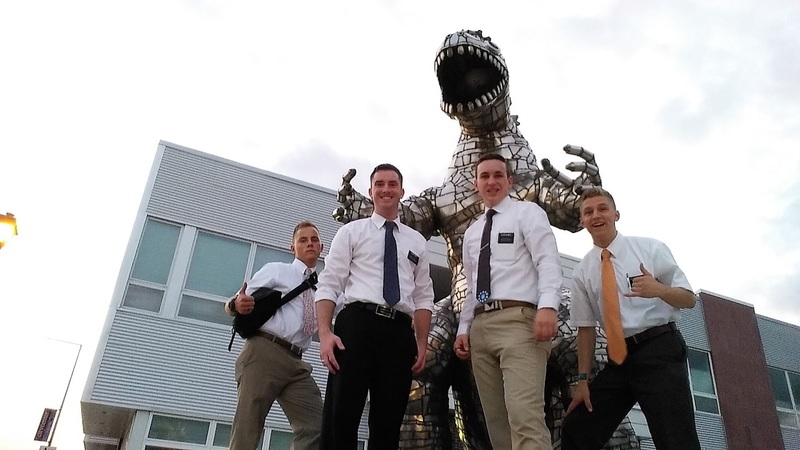 And I got a call last night with the news that I would be training another new missionary! 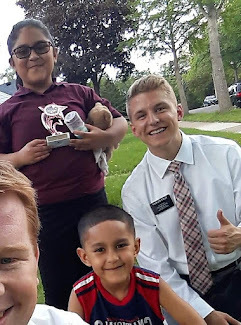 I guess they think Elder Woolley turned out alright, so they’re giving me another go at it. I'm super pumped! Cross your fingers I get another awesome greenie. Also, it was kind of expected since I've been in Mankato for a while, but I'm leaving and going to Fairbault! It's still out in the middle of nowhere. In fact, it's in the same district still so I'm not going far. But, I'm going to miss the area a lot, the ward here is SO great! It will be bitter sweet for sure. Other big noticias… our mission is getting Facebook approved! If you see me post something on Facebook, don't worry I'm not being disobedient! Haha. It will actually be really nice to contact and invite members and investigators over Facebook, but more on that in a few weeks! Well today we get to go to the Minnesota State Fair up in St. Paul!! I've heard it's one of the biggest in the US so it should be a fiesta! I love all of you guys, thanks for all the prayers you send my way. I know that God lives and loves us! The church is true. Cuídense!